At Dell’s launch of its “Hybrid Business” strategy today, the company spent a few minutes talking about its history of developing new standards, and forcing them on the industry. One of the standards discussed: Display Port. 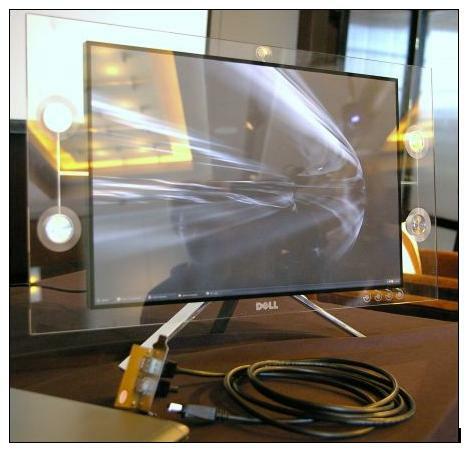 This new interconnect, according to Dell CTO Kevin Kettler, will redefine what an LCD monitor looks like. It will support up to 4x the current HDTV resolutions, allow for integrated peripherals around the display, and will let you daisychain multiple monitors, rather than installing them in a star configuration. Everyting, including audio, microphone, panel I/O and more will all go through a single bi-directional cable. Even better, by eliminating a lot of the electronics used for video conversion, new LCD monitors will be super-thin, and super sleek. The prototype, displayed above, should be available later this year. It’s only about a half an inch thick. Display Port also promises to make notebook monitors thinner too, said Kettler. Wireless networks for the home and office have become sort of the de facto standard for those of without the luxury of Cat 5 cable runs. On the other hand, anyone that has ever used a wireless network within the confines of a multilevel dwelling or office also knows that Wi-Fi networks can be rather unreliable. There are obvious security risks, as well. 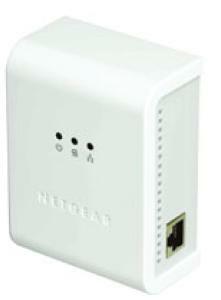 Alternatively, Netgear has introduced 85Mbps powerline Ethernet adapters that turn any wall socket into a Fast Ethernet connection. I tested a pair of Netgear’s XE103 85Mbps Wall-Plugged Ethernet adapters across my lab’s simple Gigabit Ethernet router and network. Installation was as simple as plugging one unit into a wall outlet near the router and connecting a Cat 5 cable from the adapter to the router. At the other end, I plugged another adapter into the wall outlet near my client machine and connected the adapter to my system’s Ethernet NIC. I didn’t need drivers or other software to install and literally set up both adapters in seconds. These units use copper power lines in your wall to transmit an Ethernet signal while isolating the electronics from the AC current. The pair of XE103s worked like a charm right out of the box—not something I can say for Wi-Fi in remote corners of the building. My real-world tests showed the XE103s were able to stream 1080p video content without a hiccup. File transfer rates were slightly faster than 802.11g, even when our Wi-Fi setup had excellent signal strength. My Internet download/upload test showed the XE- 103-connected client posted 1,696KBps download and 92KBps upload speeds, which provided a more-than-snappy Web experience over my 6Mbps cable connection. Kudos to Netgear for doing powerline networking right. Creative has already extended its X-Fi audio processing technology beyond its sound cards (most recently to iPods), but it now looks to be trying to plant the sound-boosting gear in the rest of your house, and it’s hoping that its new Xmod Wireless system will be the device to do it. As with its other X-Fi products, Creative is boasting that the system will make “MP3s sound better than CDs,” with no setup or configuration required. Unlike the standard standard Xmod device, however, you won’t have to sit at your computer to enjoy that impressive, if somewhat questionable feat, with the main Xmod Wireless unit able to transmit tunes to up to four receivers within a 100 foot range (only one is included). You’re also apparently able to use the included remote with both the transmitter and receiver to control volume, song selection, and other functions. There’s no WiFi here though, just the good ‘ol 2.4GHz frequency — which would seem to open up the possibility of interference, although Creative seems confident that won’t be a problem. If you want to check it out for yourself, you can snag the bundle of one transmitter and one receiver now for $200, and as many additional receivers as you like for $100 apiece. You don’t have to be an audiophile to listen to digital music and know that something is missing. Some of a CD’s richness doesn’t quite make it into the digital version when it’s converted. To help restore this lost texture, Creative has introduced the Xmod, a small gadget that plugs between your PC speakers and audio source. An audio processor that reconstructs and restores the lost textures of digital recordings is the heart of the Xmod. And it works. The tone and the quality of music played through the Xmod just sounds better. With both streams and digital files, the music was both richer and fuller than I expected—almost 3D. The effect was present with either speakers or headphones. Setup is easy. In the standard configuration, I plugged the Xmod into an audio source and connected it to a USB port (which doubles as power source) and my PC speakers (or headphones). Windows XP immediately recognized the device and required no configuration. However, it would have been nice if the package had included an extra audio cable to connect to a MP3 player. With a small footprint and stylish exterior, the Xmod’s design is elegant. The volume control and mute button are particularly welcome conveniences, and the glowing blue status lights are as functional as they are attractive. Be aware that the Xmod’s power demands limit its portability. Because it needs to draw power from a USB port or the external power adapter, you won’t be connecting the Xmod to your iPod and running around town with it. But for the true digital music lover, the Xmod is must-have hardware. For this price, this attractive and easy-to-use product adds tremendously to the digital music experience. Oh boy, another bendy display we won’t likely see on the market any time soon. This time it’s Sony’s turn to tout with this, their 2.5-inch, 160 x 120 pixel OLED display on a flexible plastic film. Better yet, this organic TFT delivers a relatively stellar 16.7 million colors compared to the 262k and 16k colors Samsung and LG.Philips, respectively, were showing off last week. That’s a world’s first 24-bit color depth for these types of displays. Take that Samsung. The display also measures a mere 0.3-mm thin which easily bests the hapless Korean (and Dutch) giants. The only downside (if you call it that) is the display’s “greater than” 1000:1 contrast ratio compared to Samsung’s 10,000:1 rating. But by now you’ve learned to take contrast measurements with a grain of salt, right?